She brushes her teeth 3x a day. I had wanted to bring her on her first dental visit on her 2nd birthday after hearing all the horror stories from my friends about their toddlers having tooth decays before the age of 3. Ya.. *Kiasu Mom over here. But the images of my niece’s 2 pearly white front teeth reduced to 2 black thin stumps remain vivid in my mind. But everyone was advising me against it as she may develop dental phobia if she’s put on the operating, I mean, dental chair too early. I’m a victim of dental phobia. Even now, I still get gripped by occasional bouts of fear when I’m on the dental chair. The incident that caused it is “life-changing”. 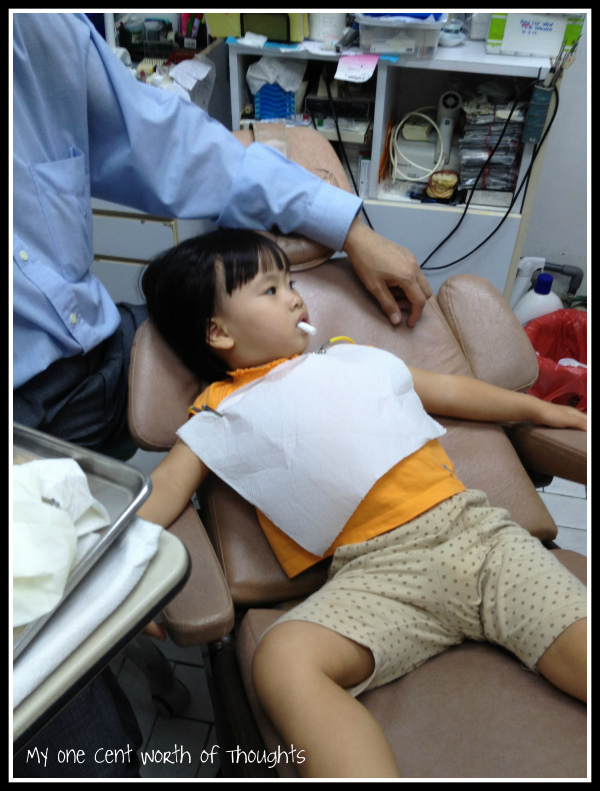 I remember being taken to a polyclinic, because my molars were killing me (literally!!) Thank goodness they were my first teeth. I was put on the dental chair and a dentist (later I found out that he’s an understudy) came up to me with this fat needle and syringe! (It was the fattest needle I had ever seen in all 7 years of my life, at that time). He poked it into my gums and ouchhhhh!!!!! to inject the anesthesia. There were like 2 people over me, holding me down. Sounds like some child abuse horror movie?! The next thing I know, he took out a huge pair of pincers, gripped my decayed molar and tried to rip it out!!! For some reason, he couldn’t extract it, so he was turning and twisting it in my mouth!!!! With me screaming and struggling to get out!! Finally it broke into pieces and he extracted it with 2 other people holding me down this time. I swear I had nightmares that night and my mouth swelled up like a puffer fish for 2 whole weeks. He ought to be jailed and shot!!! HMPF!!! My mom swore not to bring me to a polyclinic anymore, but the damage was done. 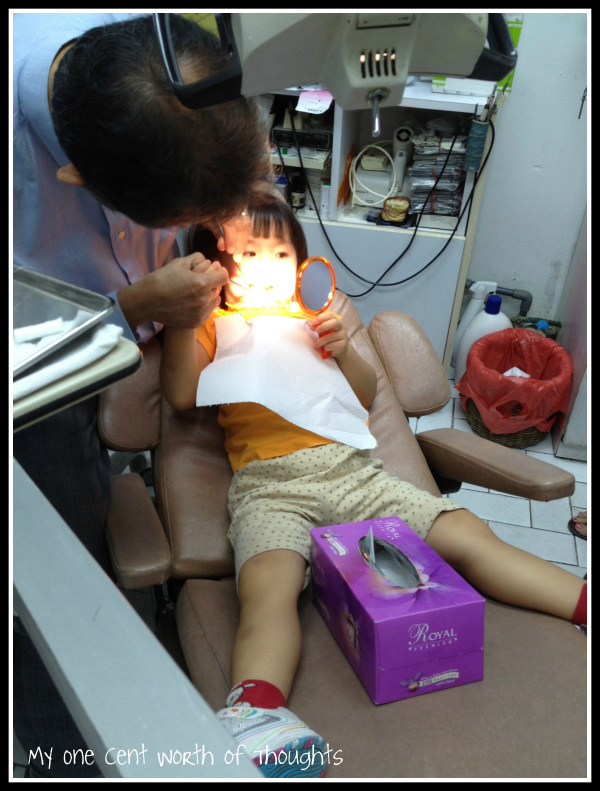 The next time I needed a dental check up, she brought me to a private clinic. I was put on the dental chair (darn! I hate that chair!) while the dentist prepared the tools of torture (Oops! I mean of his trade). With the spotlight glaring at me, the shiny tools twinkling, all the nightmarish images came back to me. I jumped out of the chair, flung the door open and took off in record high speed!! (I was never good at short distance running but that was for self-preservation!!) Everyone was taken aback by surprise and they caught up with me about 500m away and dragged me back to the clinic. Awww.. So much for the great escape. No amount of coercion and cajoling could get me back in without struggling. So they gave up. Finally I had to go back because of the pain from the toothache. So now, it’s a matter of which had a higher degree of pain. Sigh… I got through it but with a lot of cold sweat and shivering. I’d never put 宝贝through that. My dentist advised me to prep her up for it before the visit and to bring her favorite soft toy for comfort. So I did my prepping and motivational gag on her. Me: 宝贝！Mama is going to bring you for a dental visit. Me: Yes. 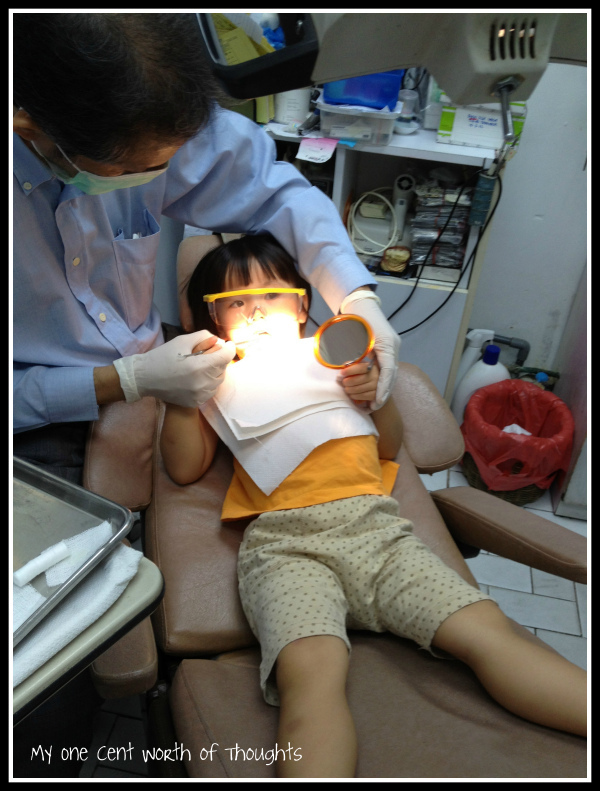 I’m going to bring you to Dr Tan, who is a dentist and he’s going to give you beautiful white teeth. You are going to sit on a fun chair, wear huge goggles and he’s going to use an electric toothbrush on you. You are going to be so pretty after that! (Appealing to her vanity sometimes works.) Would you like that?? It’s going to be so fun!! We had to wait for a while for our turn. More prepping outside the door until she got so excited about it that she kept asking when’s her turn. (fingers crossed… good sign). It’s our turn!! She was put on the dental chair. Dentist : Where’s her soft toy?? Me: Erm… oops.. forgot to bring it! (Bad Mama!! But in reality, she’s hardly a soft toy person.) Dentist gave me a “tsk tsk” look. (He gave her a model of the mouth and teeth and explained all the terms like canine, pre molar, molar etc… and what he was going to do. She listened silently, as usually) Look at this light? It’s really fun! (Switched the light on and off) (Gave her a mirror). The light enables you to see your teeth clearly!! If you turn the mirror over, your teeth become twice the size!! (She fiddled with the mirror) (Showed her the little dental mirror) I will be using this little mirror to look at your teeth! You can see me doing that with your mirror! There she is! Looking at herself in her little mirror. Looking totally “unglam” with the tissue box sandwiched between her legs. But at least she didn’t look traumatized. Dentist : Let’s put on some cool goggles, shall we?? Haha! In her oversized yellow goggles! Dentist : (held her hand over the spray) Press this! See! Water comes out from here to clean your teeth! And you can even blow air! Now I’m going to clean your teeth with an electric toothbrush!! She was silent throughout the entire thing. (What’s new… she’s always very quiet around people she’s new to.) It all went without a hitch. There she is! Relaxing after the cleaning. With a *cigar* in her mouth. Sigh.. Looks like an *Ah Lian.